The electric vehicle wireless charging solutions firm Evatran has revealed that it expects to offer wireless charging systems compatible with 80% of the electric vehicles currently on the roads of North America by the end of 2017, according to recent reports. We’ve covered Plugless Power for years, but it seems like it’s been awhile. Basically, Plugless Power is one of the top providers of wireless home EV charging stations. (Actually, it claims to be the provider of the world’s first wireless EV charging station.) Someone from Plugless Power (or, more accurately, Evatran) recently dropped me a line to let me know about some big news. In a previous article we highlighted Witricity, a very innovative company looking to truly disrupt the nature of powering and charging battery powered devices with wireless charging products. One other company that has made such wireless charging products available today to electric vehicle owners is Evatran (or Plugless Power). Forgot to plug in your electric vehicle? Rebecca Hough hopes to fix that with Evatran’s charging pad for cars. Time for a Plugless Power update! USA: What has Plugless Power been up to? So, what’s been happening with Evatran recently? Many of you have been asking “What’s new with Evatran?” Well, here’s your chance to find out what’s happening with us and the EV market in June 2012! The Governor’s Office of the State of Virginia will be hosting the 2012 Apollo Launch Event for the Plugless Power product line. The event will be held on February 23rd, 2012 at the State Capitol in Richmond, Virginia. See here for more information. They will also be trialing the wireless charging technology, as systems become available. One of main impediments to the uptake of electric cars is the presumed hassle of charging them. 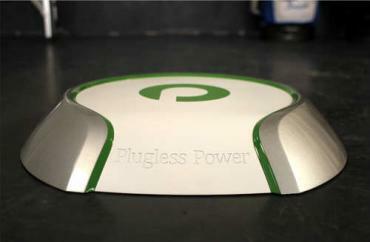 Plugless Power is testing a wireless charging system with partners Hertz Rental, Clemson University, Duke Energy and others. Sears offers an installation service to put the charging system in the homes of people who own the Chevy Volt or Nissan Leaf.